When clearing the garden yesterday, I came across this wild blackberry bush. It was fun to disassociate a name so linked to my work life. My blackberry is indeed with me, but it stays at home. I check it only at night in case of any mini disasters at work. I hope this post introduces some balance to the virtual libraries… As hard as it is to believe – and please go ahead and test this – if you use google image search for the word ‘blackberry’ you will get pages of images of mobile phones! In my test, the first image of an actual blackberry fruit appeared on page 12… and then more mobiles until page 18 when another lonely fruit appeared! I stopped looking after that. We will pick and eat the ripe blackberries tomorrow. 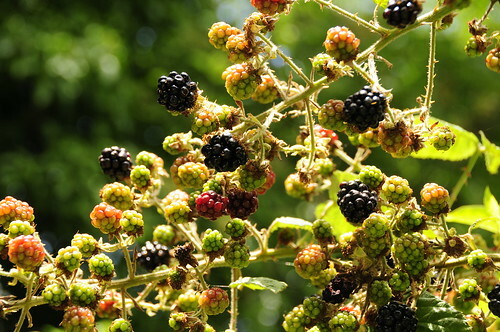 I grew up in the southestern US where wild blackberry’s were very abundant. I think it’s my favorite fruit. 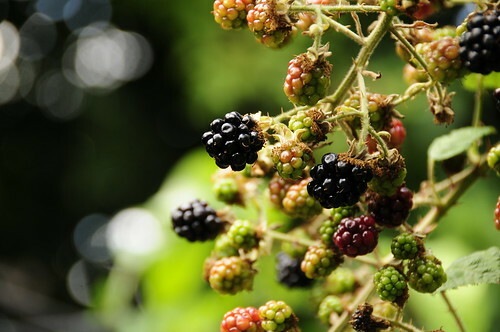 I loved eating them while picking them and they were still warm from the summer sun. Great photos (as usual!) – especially the top one; I can visually taste that large one in the center! Hopefully your post will help bring a sense of balance to the personal lives of those who need as much as it does to the virtual libraries! Sounds like your vacation is off to wonderful (and delicious) start! I’m not a blackberry fruit person but you are right, it doesn’t come up on the images only the phone! I tend to leave work aside when I’m traveling, only checking when I need to!